Nicknamed 'The Evergreen State,' Washington is a state located in the Pacific Northwest region of the United States. Olympia is the state capital, and Seattle, located 60 miles north from the capital, is the largest city in the state. From dense temperate rainforests in the west, to the expansive Palouse in the east, and bordering the might Columbia River, Washington state is famous for prodigious mountains, rugged coastline, marine climate, and agricultural wealth. It is the 18th largest state in the US, by area and nearly 60% of the Washingtonians reside in the Seattle Metropolitan Area. Other major cities in Washington are Spokane, Tacoma, Vancouver, Bellevue, and Everett. Washington covers an area of 71,362 square miles, and has a population of 7,170,351, as of 2015. Washington is a prosperous state, and has a thriving industry. It is the leading producer of lumber, and a major producer of apples, sweet cherries, pears, and raspberries. Mount Rainier National Park − A very popular tourist destinations, Mount Rainier National Park, is home to amazing flora and fauna. Every year, more than a million people visit the national park to view the mountain, valleys, waterfalls, old growth forests, wildlife, and to indulge in hiking and mountaineering. Olympic National Park − A World Heritage Site, Olympic National Park comprises unique wildlife like mountain goats, red foxes, bobcats, black bears, golden-crowned kinglets, and red crossbills, among others. The park is home to a temperate rainforest, and it is one of the wettest places in the continental US. Hurricane Ridge provides fabulous views of the national park. Puget Sound − It is located along the northwestern coast of Washington, and is the second largest estuary in the country. Space Needle − Located in Seattle, the Space Needle is an observation tower and restaurant, that provides stunning views of the Seattle skyline, as well as Mount Rainier, Olympic, and Cascade mountains and surrounding areas. Pike Place Market − A public market, Pike Place Market is located in Seattle and is the world's 33rd most-visited place, as well as home to the original Starbucks coffee shop. Snoqualmie Falls − A spectacular tourist destination, Snoqualmie Falls attracts approximately 1.5 million tourists every year. San Juan Islands − One can indulge in interesting activities at San Juan Islands such as sea kayaking, with the hope to spot an Orcha whale. Other notable places in Washington are; Cascade Range, Mount St. Helens, North Cascades National Park, and the Museum of Flight to name a few. The Seattle-Tacoma International Airport (SEA), Spokane International Airport (GEG), and Tri-Cities Airport (PSC), are the major airports in Washington. The Boeing Field, which is located in Seattle, is one of the country's busiest primary non-hub airports. Three Amtrak passenger trains Cascades, Empire Builder, and Coast Starlight, serve the state. The interstate highways I 90, I 5, and I 82, along with Washington Routes traverse the state. 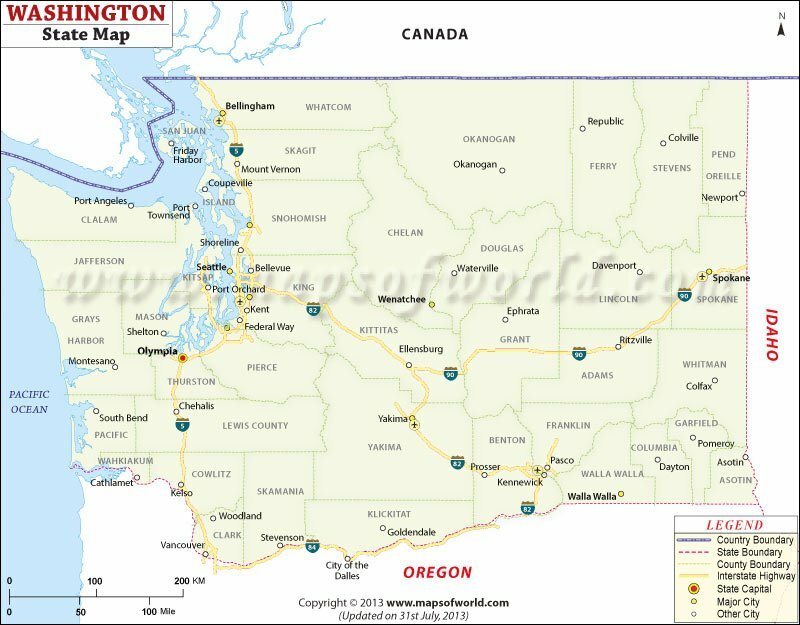 Washington is the only state named after a United States President, George Washington. The Grand Coulee Dam on the Columbia River, is the largest concrete structure in North America. Mount Rainier, the highest point at 14,410 feet (4,392 meters) in the Cascade Range, holds more glacial ice than rest of the 47 contiguous states combined. Microsoft Corporation is located in Redmond, Washington, United States. Amazon.com, REI, and Costco, also make their home in and around Seattle. The biggest coffee chain in the world, Starbucks was founded in Seattle. Olympia is the state capital, and the largest city is Seattle. King county, the largest county in Washington State, was originally named after William R. King.